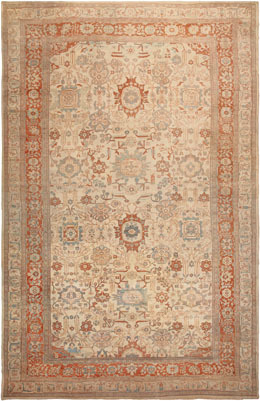 Originally from Manchester, England, the Ziegler company established itself in Arak (Sultanabad) in 1882 and was active there until the 1920’s, producing almost exclusively room size and larger carpets with large scale allover floral patterns in colors resembling those of Turkish Oushaks of the period: sky blue, rust, pale green, ivory, shrimp, light gold and dark blue. 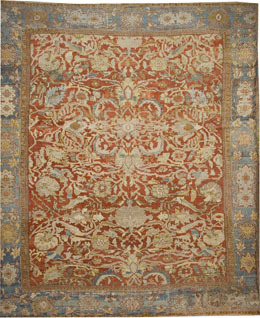 These antique Persian carpets are highly decorative, working extremely well with almost any furnishing theme, always looking opulent without being overbearing or calling undue attention to themselves. The patterns are grand and engaging, there is plenty of open space and the colors are mellow. There are no substitutes for these carpets when a Ziegler (Mahal) is called for.